Hotel Punta Negra is an excellent base to explore the local area, plus it's in a fantastic location, right on the beach. 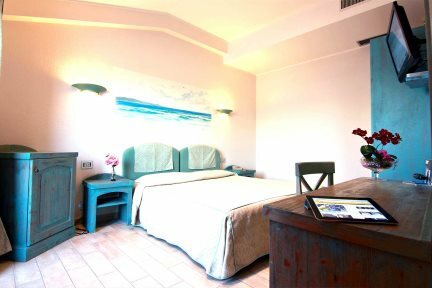 A hotel boasting a breathtaking seafront location just a 20-minute drive from the alluring town of Alghero, Hotel Punta Negra provides a scenic and rejuvenating escape. While relaxing may well be the order of the day, the hotel has enough amenities and activities to ensure a little action and adventure will never be out of the question during your stay, should you fancy it. Defined by its low-level, Mediterranean-style architecture, blessed by a spacious terrace which provides superb views of the ocean and the natural surroundings, Hotel Punta Negra makes the most of its idyllic position on Sardinia’s west coast, particularly in the shape of its sea view rooms. The quiet and peaceful surroundings are reflected in the attractive rooms, adorned with traditional Sardinian designs and providing great comfort, coming equipped with air-conditioning, a minibar, television and free Wi-Fi. 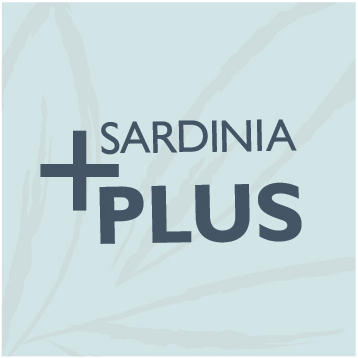 The perks continue outside your room, with the hotel’s two restaurants ready to serve up some delicious Sardinian cuisine. Ristorante Punta Negra can be found inside and operates for customers on half board basis. Ristorante La Luna, which operates in the summer months, serves delicious food on the sea-view terrace. Two outdoor swimming pools provide even more relaxation for holidaymakers, while a stunning stretch of private beach effortlessly demands your beach towel for a spot of sunbathing. You’ll find plenty to do during the day, with the hotel happy to help arrange great outdoor activities for you to enjoy, such as horse-riding and diving, and the opportunity to embark on sailing or boat excursions. You’ll also find you’re in an ideal location for exploring the harbour and historical centre of wonderful Alghero, as well as discovering the beauty of Porto Conte Regional Park. Two swimming pools, baby pool, Jacuzzi, two restaurants, excursions available (payable locally): boat trips, mountain bike hire, horse riding, diving, trekking, quad and jeep hire. 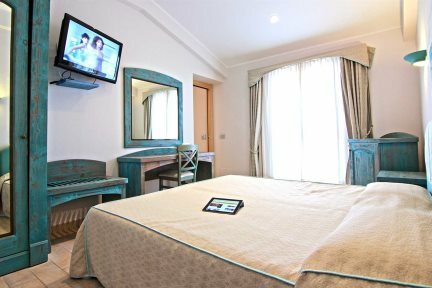 En-suite facilities, air-conditioning, Sky television, telephone, hairdryer, safe, minibar, Wi-Fi. The Standard rooms are all fitted with a bathroom and shower, air-conditioning, Sky television, telephone, hairdryer, safe, mini-bar, Wi-Fi and have a balcony overlooking the pinewoods. The Standard sea view rooms are all fitted with a bathroom and shower, air-conditioning, Sky television, telephone, hairdryer, safe, mini-bar, Wi-Fi and have a balcony overlooking the sea. The Sea View suites offer elegant furnishing and superior comfort. The rooms are fitted with a bathroom and shower, air-conditioning, Sky television, telephone, hairdryer, safe, minibar and Wi-Fi. In addition, the suites are situated in a splendid scenic location and have a terrace. The Family rooms are all fitted with a bathroom and shower, air-conditioning, Sky television, telephone, hairdryer, safe, minibar, Wi-Fi. 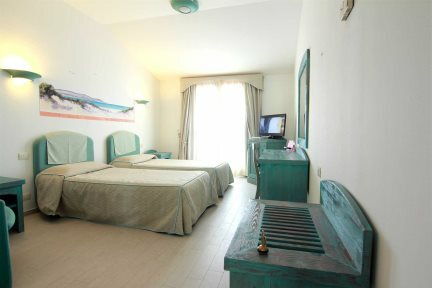 The rooms have 2 interconnecting rooms, one with double bed and the other with 2 or 3 single beds.